Today at the 2006 Geneva International Motor Show, Microsoft Corp.'s Automotive Business Unit introduced Windows Mobile for Automotive, a software platform and hardware reference design that helps the automotive industry speed the development of in-car infotainment systems for drivers and passengers worldwide. Concurrently, Microsoft and Fiat Auto Group unveiled Blue&Me, the first in-car infotainment system based on Windows Mobile for Automotive. Blue&Me allows motorists to use voice commands and a push-to-talk button to operate their mobile phones, digital music players and other devices in a safer, more convenient manner in the car. The system supports hands-free communication for more than 140 types of mobile phones via a Bluetooth connection, and through a Universal Serial Bus (USB) port it can connect with a wide variety of personal music players and other devices. The software is upgradeable, so it can be refreshed to accommodate consumers' changing needs supporting future devices and new industry standards. The system supports nine languages and is available to drivers and passengers throughout Europe in the company's Fiat Grande Punto, Alfa Romeo 159, Alfa Romeo Spider and Alfa Romeo Brera models. "The digital lifestyle is about staying connected with people and information, and enjoying digital entertainment, wherever you are — even in the car. Working with Fiat we have delivered automotive-grade systems that extend the digital lifestyle into the car at a price that is affordable to most car buyers," said Robbie Bach, president of the Entertainment and Devices Division at Microsoft. "Windows Mobile for Automotive provides performance, reliability and flexibility for a new generation of in-car communication and infotainment solutions." "By partnering with Microsoft, we've been able to design, test and deliver a new in-car infotainment system to market in less than two years," said Giuseppe Bonollo, vice president of Product Portfolio Management at Fiat Auto. "We look forward to offering similar Microsoft-powered systems to our customers in every new Fiat, Lancia and Alfa Romeo model over the next few years." Microsoft Windows Mobile for Automotive provides the industry with an open, standardized platform for in-car infotainment system development. Automakers developing in-car infotainment systems using the platform can tailor functionality for specific models or desired price points. For example, a navigation system in an economy car might only provide voice prompts and a heads-up display, while a luxury model may offer a full-color LCD display featuring maps and real-time traffic information. As a result, Windows Mobile for Automotive helps the industry achieve the following: — Fast time to market. Manufacturers can move quickly to market with a standards-based, ready-to-install electronics gateway that gives consumers hands-free digital access to cell phones, music and information in their cars. — Low development costs. Windows Mobile for Automotive frees OEMs from the need to develop proprietary software - with its associated high development costs. This entry-level solution is based on a familiar Microsoft programming model and supports industry standards for reliability, power consumption and temperature variations. — Flexible implementation. Available in two versions, Windows Mobile for Automotive can easily be tailored to meet automakers' needs across a variety of models, vehicle types and price points. Because the software is upgradeable, support for new devices, applications and industry standards can be added to increase functionality for drivers and passengers over the life of the car. Software upgrades can be easily deployed by the dealer via the wireless connection or USB port. My team is completing an application for a company that contracts to electrical utilities on the East coast. They are involved in meter maintenance and repair. 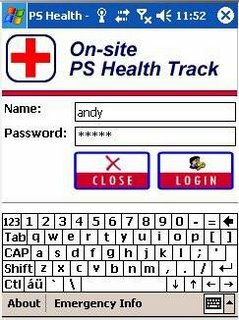 The unique part of this application is that they asked for both a PDA version of their mobile application, and a Tablet PC version. I have included a screen shot of their Tablet PC version. 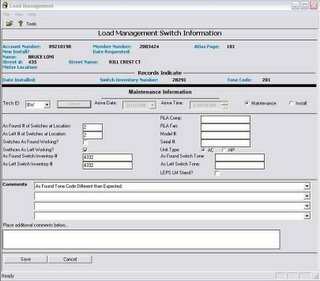 We developed and configured this application using PointSync software. They also required us to integrate their mobile application with GPS and their backend database. PointSync allowed us to build one application, and publish it to 2 different formats, 1) Pocket PC and 2) Tablet PC. The application did not change, just the way we layed out the screens. Since the Tablet PC has bigger screens, we could display more information on it. We have recently completed a project for a very large fossil fuel power generation plant in the SE. It involved safety inspections to conform to OSHA requirements. A sample of the Pocket PC application is displayed here. This project involved labeling equipment and breaker boxes with bar code labels, so inspectors could quickly scan then to determine the date of last inspection and maintenance cycles. This data was then synchronized with a central safety compliance database for storage and auditing purposes. 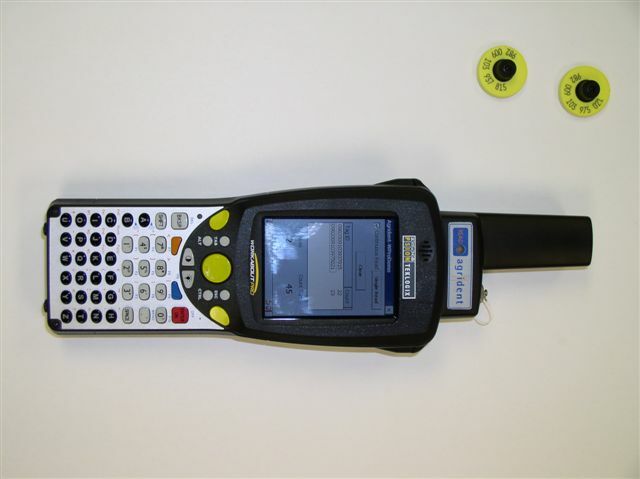 This safety and maintenance inspection application was customized and configured using MobileDataforce's PointSync and used Dell Axim Pocket PCs using bluetooth Socket Scanners for reading the bar codes. Our professional serivces team has recently completed a very successful project with Kane Furniture that involved mobilizing their work order management system. Tim Cerami, our PSO Manager has written up the details for your reference. Since 1948, Kane’s Furniture has become one of Florida’s fasting growing furniture retailers. Along with this growth came the challenges of managing an efficient service order organization. Kane’s knew their existing paper-based service order system was costing them valuable time everyday due to costly data reentry. By introducing mobile technology in the field, Kane’s and MobileDataforce engineered a custom solution that allows technicians to completely eliminate paper, respond to customers with more complete information and eliminate costly data reentry entirely. MobileDataforce developers and engineers worked with Kane’s management and technical team to build a custom mobile application (similar to the one seen in the picture above) and data transfer process that streamlined the process of getting data from the field to their backend database. Kane’s chose standard Dell Axim handheld devices for its mobile service technicians. Devices are brought back to the office where they synchronize to the PointSync Server using standard USB cradles. At the heart of the mobile solution is the MobileDataforce PointSync mobility tool. To build a simple, easy to use mobile application, PointSync Developer was used to quickly build the user interface and business logic. To facilitate device connectivity and synchronization logic, PointSync Server and Manager where deployed. To seamlessly integrate with Kane’s existing backend database design, customized file exports were also integrated into the PointSync configuration. With PointSync mobile technology being used in each service technician’s hands, Kane’s saves over two (2) hours per day for each of their store locations. With this glowing success in their services organization, Kane’s is looking to mobilize other aspects of their business, including a large furniture delivery organization. I am often surprised. 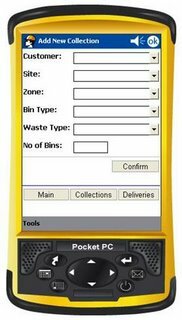 MobileDataforce's original business plan did not list waste management as an industry we were going to target with our mobile software solutions for ruggedized handheld PDAs, however we find ourselves delivering mobile waste management applications monthly. In the next couple of weeks I am going to detail a very cool waste management solution we are just now implementing in Dublin, Ireland. It involves "chain-of-custody" for waste, and compliance with new EU laws. The common threads in these applications are the use of MobileDataforce's PointSync software, waste hauling trucks/lorries, waste containers or bins, and documentation of all materials picked up and delivered. This is an interesting blog on the subject of mobile applications in the rail industry. MobileDataforce is now working on a proposal to use RFID to inspect and inventory cargo in rail cars. This is quite interesting. The user walks up to a rail car and uses an RFID reader on a ruggedized PDA to see what is in it. This solution uses our PointSync software to integrate with the RFID reader, query a database on the handheld computer, and show information on the cargo in the car. Westminster's parking attendants using PDAs to track motorists who fail to pay their fines. I love seeing companies put PDAs to work. 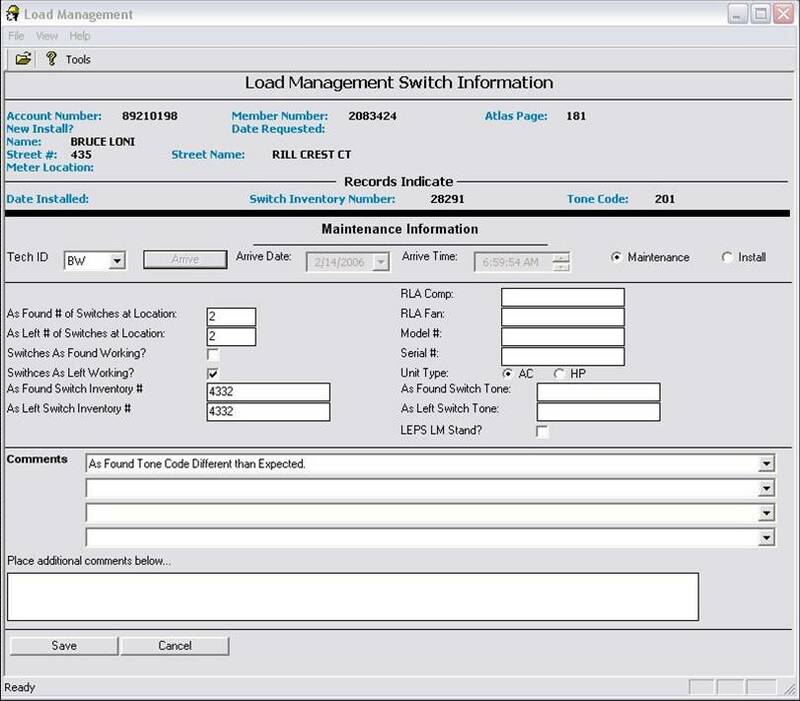 The following links show how the power of Palm PDAs can be used for machine condition monitoring, predictive maintenance, and routine troubleshooting. Datastick Systems, Inc., introduces the VSA-1212 Vibration Spectrum Analyzer, the first PDA-based vibration analyzer to use standard, off-the-shelf ICP®-type piezoelectric accelerometers for machine condition monitoring, predictive maintenance, and routine troubleshooting. 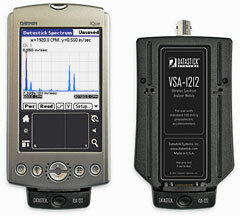 Includes VSA-1212 Vibration Spectrum Analyzer, Datastick Spectrum handheld software, and Datastick Reporting System™ for VSA personal computer software. Our Intercue Mobility Suite can be integrated with a large variety of testing equipment. The integration can be directly with the handheld PDA via USB, bluetooth or IRDA. Here is an interesting article about using PDAs in real time to convey information about an incident scene. The integration of real-time video, digital images and GPS information is particularly interesting. 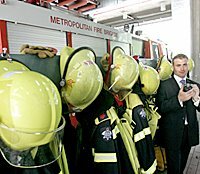 Australian IT - PDAs for fire brigade (Kelly Mills, FEBRUARY 14, 2006): "
Emergency management: Jason Catlin says the PDAs are being tested in counter-terrorism drills. The organisation is the first of a number of emergency services groups in Australia to give the nod to the counter-terrorism and emergency management system using PDAs. MobileDataforce's PointSync software is an excellent platform for these kinds of solutions. We are receiving inquiries from Fire Brigades all around the globe. We are currently working on a relatively large project for a Fire Brigade in the UK. 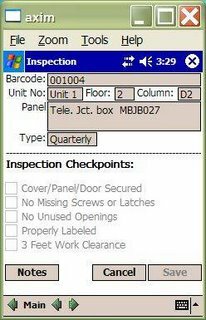 We also get many inquires concerning fire safety inspections where they use PDAs to inspect fire extinguishers, compliance to fire code, etc. the previous record of 13.2 million PDAs shipped worldwide in 2001.
of 1.95 million units in 2005. Palm regained the PDA market lead in the fourth quarter of 2005 with 1.04 "
I have been interested in RSS for sometime and recently found a good primer by Simon Dickson from the UK. If you are interested have a read. 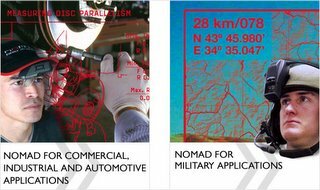 Several month's ago we got an order to support Microvision's Nomad Display System. This is one of the most unusual Win CE devices we have ever worked on. It uses a helmet, or headset display system with the Win CE device strapped to your belt. The intent of this device is to enable you to see the Win CE screen through an eye piece display that allows you to keep your hands free for other tasks. One of the featured uses of these kind of displays is demonstrated in Microvision's advertising literature. It shows a soldier with an M16 rifle in his hands and a helmet mounted eye piece. I think the concept is interesting, but there are also some challenges. It is quite easy to get dizzy, or to get eye strain when one eye is sighting down the rifle barrel and the other eye is viewing a moving GPS map. It kind of makes you feel like a Budweiser lizard. None-the-less, our PointSync software now supports these headsets. You can query all kinds of database information, diagrams, maps, etc while pretending to listen to your girlfriend or spouse across the table. 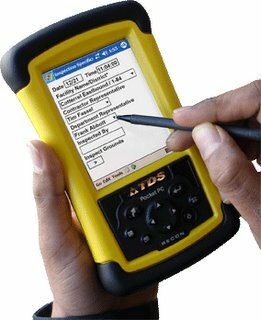 If you are working in wet and rugged environments you may want to consider the TDS Recon. I have seen them running underwater and they fit nicely in the hand. Some devices feel like they would shatter if dropped to concrete, not the Recon. Our PointSync software, for data collection and inspection applications, is used on many of these devices in outdoor environments where water and durability are an issue. Recons are about 3-4 times more money than a consumer grade Pocket PC, but will certainly last 3-4 times longer in rough conditions. The waterproof Recon weighs just 17 ounces, meets military specifications for drops, vibration, and both high and low temperature operation, and runs Windows Mobile 2003 software for Pocket PCs. The Recon works wherever and whenever you need it. Intermec's CN2 is a very interesting ruggedized device. It is under $1,000 and appears to support both Windows CE and Windows Mobile/Pocket PC. This mobile computer family relies on the proven, powerful combination of the Intel® XScale™ processor with either the Microsoft® Windows CE or Windows Mobile operating system to deliver a perfect balance of real-time data collection performance with fullshift power management functionality required by the application demands of retail store management and field sales and service. I am having one shipped to us now for internal testing. I like the price point and the design for field data collection and mobile work orders. The Treo 700w is beautiful. 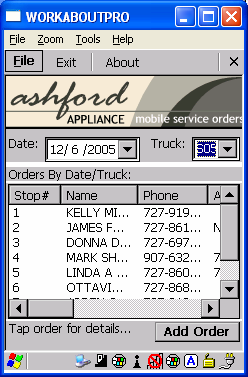 A convergent device running on the Windows Mobile operating system. It combines a phone with the power of Pocket PC. It won't survive submersion in water for long, but neither will I. For most environments where mobile phones can survive, this device is a winner. Our PointSync software is designed to take advantage of these convergent features. Our mobile applications can be quickly designed to utilize the GPRS connectivity to synchronize mobile applications with enterprise database applications. Our team in the UK has developed a very interesting vehicle tracking system using Pocket PCs, GPS and PTO sensors for the local motorway department. When roads become slippery due to snow and ice, these "grit" or "sanding" trucks drive out to a pre-determined territory and begin gritting/sanding the motorways. 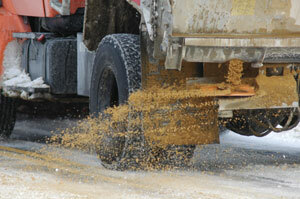 When the PTO is turned on to begin distributing the sand/grit, it sends data to the Pocket PC, and the Pocket PC activates the GPS device to begin recording coordinates. 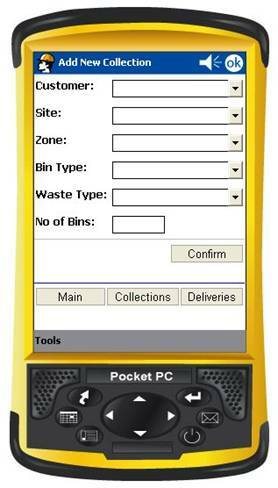 When the PTO is turned off, the Pocket PC notifies the GPS device and stops recording. This information is synchronized back to the central GIS and motorway management system so all areas that have been gritted/sanded are recorded. The value of this system is that the motorway management has a database and a visual record of where grit/sand was applied. This is useful if an accident occurs and the accident victims take the motorway management to court. They can also easily respond to reports of ungritted motorways and rapidly dispatch gritting/sanding trucks to those locations. The power of convergent devices like a Pocket PC with powerful database centric mobile software solutions that can integrate multiple data input devices is amazing. PTO sensors? Who would have thought? Thick or Thin Clients on PDAs? What is a client in the context of a PDA? 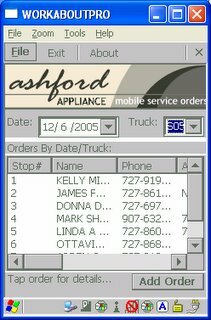 A client is a name for a Pocket PC PDA application on a wired or wireless network. Clients come in two varieties, Thick and Thin. "Thick clients" are generally the full Pocket PC operating system with a database application on it which is fully functional offline. A "thin client" is a network device (Pocket PC) that relies on servers for applications, data storage, and administration. In other words, it most often uses a web browser on the Pocket PC to connect to the data source. Which of these architectures are better? I believe having a database on the Pocket PC is best for most situations. Why? If you have no connection or a bad wireless connection, your software application can continue to function normally and later you can synchronize. This allows you to continue working and documenting your work on your Pocket PC with or without a good wireless connection. If you are using a "thin client" or web browser interface into your database back at the office, then if you lose that connection you have no application. Without your online application, you risk not being able to do your job, provide poor customer service, and wasted time and expenses. Intel, on their Mobilized Software website strongly advocates an architecture that allows you to continue working with or without a connection to a server. In addition to the connectivity issues, a Pocket PC user often wants their software application to interface with many different hardware add-ons such as GPS, RFID, Bar code scanners, automobile black boxes, digital thermometers, surveying equipment, and much more. These add-on accessories can easily be integrated with a "thick client" that has a framework that supports third party data capture accessories. A thin client browser is not set-up to handled this environment and limits your ability to take advantage of these convergent devices. Most of our work here at MobileDataforce involves implementing software on rugged handheld computers, but we also have many projects in the healthcare industry and other "white collar" industries that would be well suited to this new Pocket PC from Cingular. 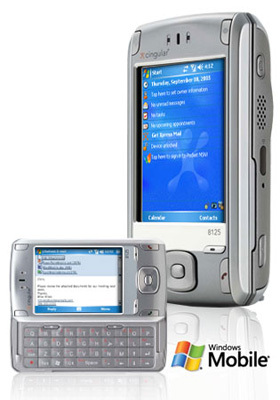 "Cingular Wireless today expanded its Microsoft Windows Mobile 5.0 portfolio with the introduction of the EDGE- enabled Cingular 8100 series Pocket PC with integrated Wi-Fi. 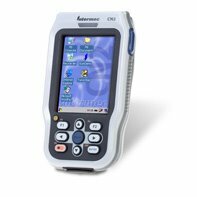 The Cingular 8100 series Pocket PCs are fully featured yet cost-effective converged communications devices that provide end-users with dual high-speed wireless data capabilities on a global scale. I have not used it personally, but the concept is right on. The ability to have a slide out keyboard with a landscaped screen for reading large email messages is very nice. Combine the Pocket PC, Phone and wireless data connection and you are ready for business anywhere. The quad-band means I can use it when I am traveling to our Den Bosch office in Europe as well. A great added bonus. The National Park Service has been a customer of MobileDataforce for over a year. They are using TDS's handheld computers running on the Pocket PC operating system and the Intercue Mobility Suite software to do asset management in the National Parks. Not just the standard buildings, equipment and other common assets, but also national treasures in the form of archeological sites. In New Mexico and Texas they are capturing data on the locations and the inventory of relics found at archeological sites of native American Indians. This data is synchronized to a central database at the National Park Service. 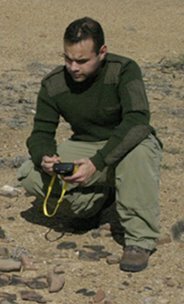 I love examples of how handheld computers can be used on the side of a cliff, in the dust, sand and under a hot desert sun. Traditionally this was done with a dusty clipboard and faded paper forms that were filed in a drawer at the end of each day. Now this data can be automatically synchronized to a central database where students, scholars and the curious can have access to this historical information. Several months back we were contacted by a company that owns a large number of Hooter's franchises. Hooters is a restaurant chain known for their marketing flare, understanding of their customer demographics, and undersized uniforms. They wanted to develop handheld PDA applications that would allow their servers to survey customers and gather information on customer preferences using Pocket PCs. They wanted the results of these surveys to be immediately synchronized with a central database so management could analyze the customers feedback and improve their business processes and customer's experiences as a result of this information. During internal meetings, my engineers fought over who would get assigned to this project and be involved in the onsite user meetings. The good news is that our Intercue Mobility Suite is very easy to use for creating data collection forms. The bad news is the Intercue Mobility Suite is so easy they did not need our engineers. Sorry team, better luck next time. designed to safeguard the health of the U.S. national herd, protect America’s producer interests, and meet the 48-hour traceback requirements of state and federal health officials in the currently voluntary National Animal Identification System. My team is excited to be working with Micro Beef on this solution. This is one of those projects that can have a major impact on an entire industry. Several years ago I took a week long course in software project management. I remember the instructor talking about the phases of a project. Frustration sets in - will we ever finish? There is light at the end of the tunnel, they see progress. The instructor taught us that this is a natural software development project cycle. You know what, the instructor was right! Software projects are difficult, hard and tedious. Changing business processes and the way things have always been done is uncomfortable. Sales people (myself included) often stress the ease and simplicity of a software project, but in truth our software consultants and engineers must put in long and hard hours developing a solution that meets the customer's expectations and needs. Technical issues without easy answers arise, people get sick or go on vacation, hardware does not get delivered on time or is dead on arrival, project timelines get missed, and unexpected issues emerge. How do you avoid these issues? You don't completely. Experienced Project Managers simply anticipate them, build time into the project for them, prepare their clients for these issues, communicate them as they happen, and keep the client updated on project progress, and when it is all done. Everyone is celebrating! My team is working on a very satisfying project right now. The project involves providing about 500 children, that have a serious disease, Pocket PCs that include an integrated phone and digital camera with our software to help monitor their condition at home. These children will report when they take their medicine, how much and share how they feel with their remote care givers via the Pocket PC. Any minor injuries suffered during the course of the day can be photographed and shared remotely with their care giver. The data gathered on the children's Pocket PCs is synchronized remotely to a central database for the care givers. 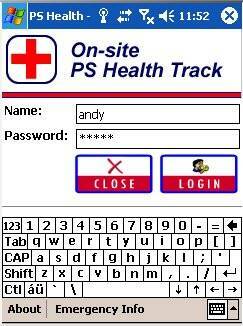 This allows a care giver to remotely monitor their patients through a browser based interface. We used our PointSync software to develop the graphically rich interface so the applications can be easy and appealing to the children. We also created the management website for the care givers. It will be very interesting as we roll this project out to hear from the children and gather their feedback on usability issues. It was just before 8 AM and I received a very interesting call from a large engineering firm asking for our expertise. Seems they were bidding on an urgent project to locate and remove 150,000 abandoned cars in Louisiana following hurricane Katrina and they needed our help. The requirements were for data collection software and handheld computers with integrated GPS and bar code scanners to enable the tow truck drivers to quickly identify abandoned cars by their VIN numbers, record the location of pick-up, and then document the location where the vehicles were towed. This information would be synchronized to a central web-based database. Luckily, we were prepared for this opportunity since we had recently completed a vehicle inspection application using our PointSync solution. This enabled us to quickly respond to the emergency inquiry and commit to achieving their very short deliverable timeline. For the technically inclined reader who wants to learn the details of synchronizing mobile devices to enterprise databases check out this blog written by Dave Wasden The Sync Log.